This is such a GREAT set and guess what? Create with Connie and Mary has and AWESOME collection using this set! Check it out! It’s time again for another SUO challenge and our theme this time is Easter Fun! Well the only real ‘Easter’ set I have is For Peeps Sake – what a cute set this is! I decided instead of going with a springy ‘pastel’ look I would go with just yellow and black which is perfect I think for those little peeps! Aren’t they just the CUTEST? I think they are just ADORABLE!!! And of course they look best when they are cut out! You know me! 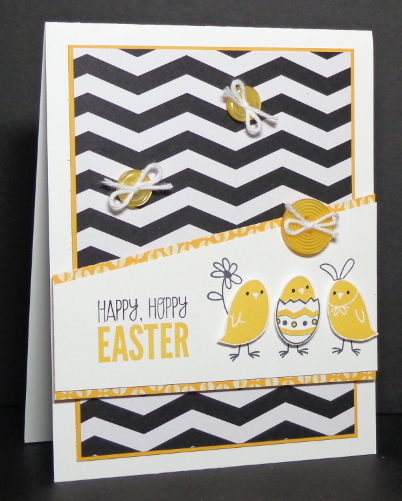 Black/White Chevron print (Stacked with Love dsp paper pack) – 3 5/8 x 4 7/8, layer onto Crushed Curry 3 3/4 x 5 and layer onto card front. Whisper White – 4 1/4, left side 1 1/4, right side 2 1/8 – cut along the top on a diagonal. Stamp greeting in Basic Black and Crushed Curry. Stamp chicks feet and ‘extras’ using Basic Black. Stamp chicks using Crushed Curry, cut out, color eyes with using Basic Black.- add using dimensionals. Tie white bakers twine into Best Year Ever SAB Crushed Curry buttons and add using glue dots. And make sure you check out the Weekly Special…WOW…there are some good ones in there too! If you have any questions, let me know. 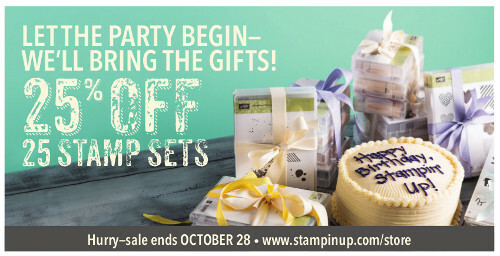 Until next time…HAPPY STAMPIN’!